It's silly time again, that insult to the memory of one of Britain's most famous artist: the shortlist for the Turner Prize. I won't even mention the names of those non-artists in contention. 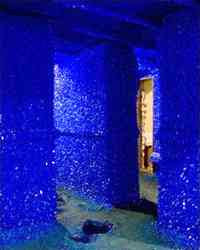 There's an interior decorator who did this blue thingy Seizure, which is the prettiest of the tripe on offer. There's somebody who recycles coal dust; very worthy, but art? And a rag doll merchant and ... oh, to hell with it. Click the title link for a BBC slide show. Charles Thomson, co-founder of the Stuckists, comments "The only interesting thing about the Turner Prize is how it manages to find such totally uninteresting artists every year." Spot on, Charles, except I wouldn't dignify these twerps by calling them "artists". The only reason for visiting Tate Modern is to see the Stuckist demo outside and grab a free badge that says it all (CLICK).